Synthetic wigs not only look chic and are good for people on the go, but they are equally easy to clean & require minimum styling. To know more on how to care for synthetic wigs, read on. Whether you are looking for a wig to add a dash of drama to your style or just wish to camouflage your thinning bald patch, a synthetic wig is any day a better choice than the natural wig. Most stylists vouch for synthetic wigs over human hair wigs since they are easy to style, warrant least care and are the best bet for the people who are always on the go. Also popular as ‘shake-n-go’, these synthetic wigs can be just tousled or smoothened with your fingers for a quickie. With synthetic wigs, the maximum effort you need to put in is to shake out the wig to ‘wake up’ the style and play with the bangs to get the look you want. You can use your finger tips to rouse your hair or use a comb to achieve a chic style and add more volume to your hair piece. The best things about these wigs are that you can just shake them to get back the original style. 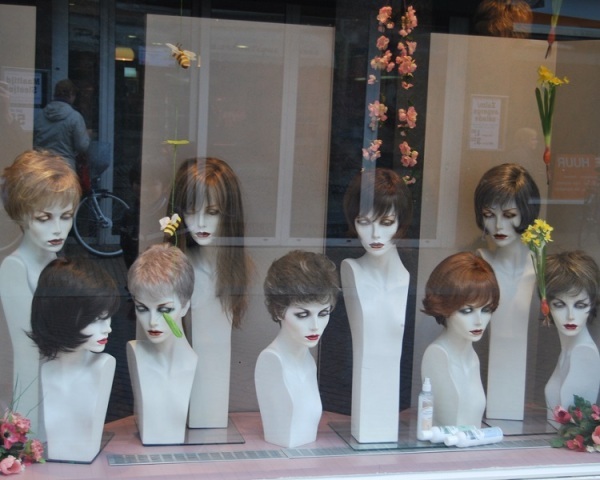 What's more, synthetic wigs are easy to care for and take much less time to restyle and shape. To know better on how to clean and style synthetic wigs, read on. Synthetic hair wigs are a far cry from the more natural human hair wigs and merit a special care to keep them shining and lustrous for long. The good news is that synthetic wigs are easy to clean, dry and care for. Although synthetic wigs do not get soiled easily, timely care is necessary to keep your wig in shape. Hair buildup from scalp oils, styling products and even dirt can make your wig look dull over time and cause it to tangle. Thus, it’s important to wash your wig once after every 10-12 use. However, if you are too much into styling gels and hair sprays, it would pay to clean your wig after ever 5-6 wears. Understand that your synthetic wigs are unlike anything natural. Thus, using a regular hairbrush will only cause it to turn frizzy and split. To entangle the knots, using a synthetic hairbrush or comb, specifically designed for the purpose would serve the purpose. You can also use a rubber tipped hair brush, since they are known to cause less friction on the surface and save your wig from turning al frizzy and frayed. You can also use a wig ‘detangler’ spritz to entangle your tousled wig, before a wig wash.
You can opt for the regular laundry detergent and a wig conditioner or go for more specific wig care products to clean your synthetic hair wig. You can shop for these wig products online or check out in beauty salons and wig shops for a better bargain. For a quick wig rinse, just fill a bucket or a basin with cold water and dissolve two capfuls of synthetic wig shampoo in it. Refrain from using hot water to rinse your wig, since the searing warmth of water will not only do away with the waves and curls of your hair piece, but also cause it to fade. Gently soak your wig in the soapy solution and move it to and fro for three minutes. However, avoid twirling the wig when inside water, as it will only cause it to tangle further. Take out the wig from the soapy solution and hold it under cold tap water. Rinse it gently and in one direction, till the wig is squeaky clean. Take two capfuls of conditioner and apply it on the hair and then repeat the rinsing procedure. You can also use live-in conditioner to keep your wig looking sleek and glossy. To dry the wig, blot the wig in a dry towel. Do not twist or wring the wig as it will only cause your wig to stretch, break and go shapeless. You can use a chamois to dry your wig, since it is three time faster than the normal towel. Place the wig on a wig stand or dry wig head to dry. Before you get on with the styling job, see that your wig is properly dried. Using your fingers, a brush or a wide-toothed comb, untangle the hair and shake the wig for a more natural look. To create bangs or curls, shape your hair using your fingers. If you wish to straighten your wig, you can use a clothes steamer to iron it flat. If you wish to curl your synthetic wig, damp the wig and then curl it using rollers. You can use a setting lotion to perfect the curls. Leave the curlers on for overnight and then separate the locks with fingers the next morning to get natural looking curls. If you wish to avoid oil buildup on your wig, you can use a wig cap. Take care to see that the cap fits you well. It shouldn’t be too tight or too loose. Never use heated styling tools such as blow dryers, curling irons or straightening irons on synthetic hair as it might thaw the fiber. Washing your synthetic hair is likely to take a toll on its life span. As nylon loses its sheen and elasticity with every wash, frequent washing will only cause your wig to wear away way too soon.